Vishal’s Paayum Puli directed by Suseendhiran was earlier announced to be released on Vinayakar Chathurthi. Puli starring Vijay is directed by Chimbudevan. The film was earlier announced to be reelased on Diwali of this year. Since the shooting was on fast pace and all the schedules of the filming are over, the team is planning to release it on September 19 which is Vinayakar Chathurthi. Vishal’s Paayum Puli directed by Suseendhiran was earlier announced to be released on the same Vinayakar Chathurthi day. 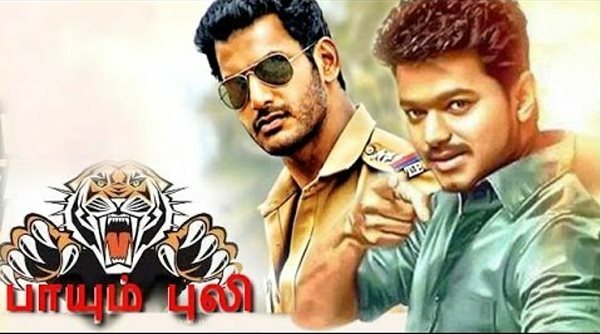 So it was predicted that Puli and Paayum Puli will clash at the Box Office on this auspicious day. It is now heard that Vishal has pushed the release date to Diwali. ‘Paayum Puli’ is directed by Suseenthiran & produced by Vendhar Movies and has Vishal, Kajal Agarwal, Samuthirakani, Soori and a host of other stars in the cast. Music is by D.Imman, cinematography by Velraj & editing by Anthony.